Before I get into this meme, I want to thank Wayne W. Smith at for participating (and hosting) so many great memes. I'm trying to get back into the blogging scene, and I've been finding something new to write every day thanks to him. :) And it's not just that he participates in a lot of great memes, but he always has something interesting to write. Check him out! Now, back to this meme. 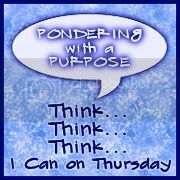 Pondering with a purpose is hosted by Brenda Youngerman. Each Thursday, she gives a topic to ponder and then gives the opportunity to link back. This week, the topic is "wandering". There are two sides of my being. One side is the part that is shy, nervous, in need of the familiar. It is the part that needs routines and touchstones. It's the part that has me call my husband several times a day, touching base and knowing that he is ok, which lets me know that, by some small extension, I am also ok. It is the part of me that checks on my kids at night. That freezes when I need to make a phone call to someone or somewhere new. The part that lives my life day after day. But the other side is the one longing for change. The side that isn't happy with the status quo and desires change. This is the side of me that will turn onto an unfamiliar road just to see what I pass. The will walk up a set of stairs I've seen but never explored. The part that allows my brain to move from one idea to the next, wondering and waiting to see what I will uncover with these thoughts. It is my spontaneity, my need for the unknown and the unexpected, my need for surprise. But this duality should come as no surprise. After all, I'm a Pisces.